First of all: HAPPY 2ND ANNIVERSARY, FLANNEL FRIDAY! Can you believe it’s been MORE THAN 2 years since Melissa at Mel’s Desk posted her first flannelboard and promised to make it a regular Friday event? And 2 years since our first round-up? Wow. What a great couple of years it’s been, and how many GREAT ideas have been shared and connections made. This flannelboard is inspired by a couple I saw on pinterest as I was perusing the “rhymes” board looking for something new to use in my rhyming stories-themed storytime. I liked LQ’s Little Green Bug on a Rug (got me thinking about “bug on a rug” and other rhyming pairs) and Sharon’s “Clap Your Lap” with its big words showing ending sounds. 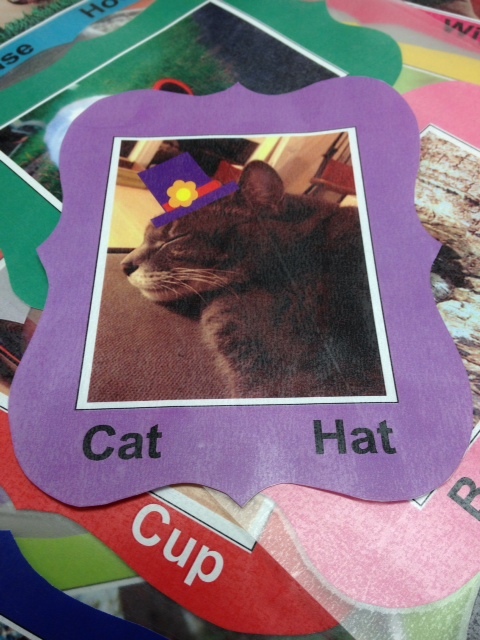 I thought it might be fun to make pictures of more of these pairs of words and have the kids figure out what they were – say the rhyming words – while adding the words to the pictures to add the print connection. Y’all know HOW MUCH I like putting words on my flannels. Not the Dr. Seuss version. There was NO WAY I was getting her to wear a REAL hat. 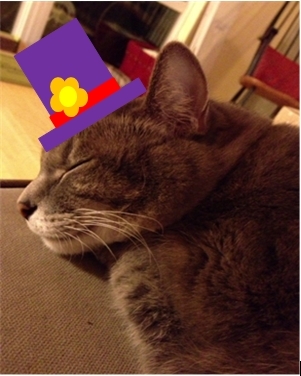 Today’s anniversary round-up is hosted by our most excellent founder, Melissa! Check there later for all the flannelly goodness, and click on the icon to the right to visit our pinterest page. Also, if you want to see where in the world your fellow flannel friday friends (ooh, nice alliteration!) are, check out this cool map that Anne, Mollie and Amy created! Add yourself if you’re not there! Sooo fun. My older preschoolers will get the hang of this in a hurry. The younger crowd will enjoy the funny pictures. Wow, my want-to-make pile is getting bigger and bigger! !